Woo, a haul. You can't beat them, I just love nosing about what other people are buying and seeing what's new in the shops. Recently my skin has really been playing up, which has been a result of a mixture of things including; stress, bad eating, and a change in weather. But nevertheless, I was in desperate need of a few new face products regardless of my temperamental skin, so a few weeks ago I jumped onto Cult Beauty and placed a wee order. I've always generally suffered with light acne and oily skin, but usually my contraceptive pill and my regimented routine keeps it all at bay. But as of late, my skin has become tired looking and stressed. Small, bumpy eruptions have become red and prominent, along with a weird combination of oiliness and dry patches. I knew my skin was suffering, so I tried to make a conscious effort to chug a little more water down and improve my diet, with a few more fruits and vegetables, and also multivitamins. The first the I added to my basket was the ranted and raved about Oskia Renaissance Cleansing Gel, which I believe every other beauty blogger now owns. I'm not generally one to follow the latest trend, but as many have positively raved, I thought there wouldn't be any harm in giving it a go. And boy was I impressed! The gel consistency works into an oil and is perfect for removing your makeup at the same time, which I'll repeat after to properly cleanse my skin. 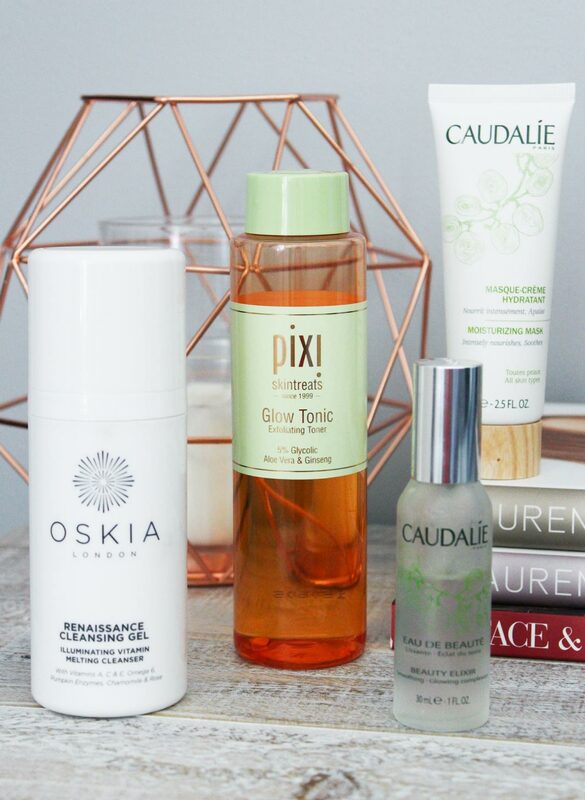 I've also incorporated the gorgeous Pixi Glow Tonic into my routine, and what a difference it has made to the complexion of my skin. This product has also massively reduced my enlarged and clogged pores, and calmed any redness my skin was having. This in conjunction with the Renaissance Cleansing Gel have worked perfectly to bring my skin back to it's former glory... with the exception of the (hormonal) volcanic eruption on my chin. As for the moisture lacking situation, I picked up the Moisturising Mask and Beauty Elixir from Caudalie. The mask recommends a twice weekly use, which I haven't entirely stuck to but for the most part I've seen an improvement in the dry patches around my eyes and temples. I'm not too sure what part the Beauty Elixir has played in my skincare routine, but the cooling spritz after toning feels too good not to use. I'm predicting that I'll be getting a lot of use out of it during the summertime, and would work beautifully as a facial mist over makeup! And for the first time in a long time, I feel that I've finally found a decent collection of skincare products that are reliable and actually work with my temperamental and sensitive skin. © Cate Renée | All rights reserved.